Bob Cooley was the Chicago Mafia’s “Mechanic”—a fixer of court cases. During the 1970s and ’80s, Cooley bribed judges, court clerks, and cops to keep his Mob clients—hit men, bookies, racketeers, and crooked pols— out of jail. Paid handsomely for his services, he lived fast and enjoyed the protection of the men he served. He had enough money to blow on all the vices the Windy City could offer, and enough standing among Mobsters to know he would never be caught. Yet, through the ‘90’s, Cooley became the star witness in a series of trials that took down the Chicago Outfit, arguably the most powerful Mafia family in the history of organized crime. This is the story of a Mob lawyer turned mole with a million-dollar contract on his head who has clanged back and forth between sin and sainthood like a church bell clapper—a turbulent youth, a stint on Chicago’s police force, law school, and then the inner sanctum of Chicago’s leading mobsters and corrupt political officials. With wild abandon he chased crooked acquittals for the likes of Pat Marcy, an Al Capone protégé, who had become the Mob’s key political operative; ruthless Mafia Capo and gambling czar Marco D’Amico; and notorious hit man Harry Aleman. He dined with Mob bosses and shared “last suppers” with friends before their gangland executions. 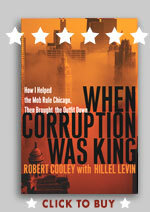 Cooley watched as Marcy and the Mob controlled the courts, the cops, and the politicians. Then, in a startling act of conscience, he walked into the office of the U.S. Organized Crime Strike Force and, without a pending conviction or a hit man on his tail, agreed to wear a wire on the same Mafia overlords who had made him a player. Cooley’s tapes and testimony would be at the center of nine landmark trials that together exposed and then broke the Mob’s unprecedented stranglehold on Chicago’s government and court system. With stunning detail and brutal honesty, Cooley now tells the personal story behind the federal government’s most successful Mafia investigation. ISBN: 0786713305; Hardcover, 368pp; 8 pp photos; Pub. Date: October 2004.